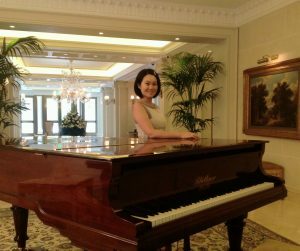 Lei is a warm, patient, and energetic piano and voice teacher, who is always keen to assimilate new ideas to consummate her teaching perspectives. Being dedicated to music education for years, Lei has been adept in finding students’ learning desire and designing the particular methods for individuals. Her lessons are full of pleasure as she is not only looking after the knowledge given in lesson, but also guiding students to be creative and musical. Lei has been attending a variety of performances and festivals. She encourages and helps her students to participate in music programs and competitions. Through practice, these students become motivated music learners. Voice teaching: apart from the systematic study in both Western classical voice and Chinese traditional singing techniques, Lei has absorbed a wide range of music styles through a highly self-motivated way; thus she believes enjoying is just as important as learning and fuses different music genres into teaching. Students are not only learning techniques but also gaining artistic sensitivity in performing music. Piano teaching: excellent piano skills require careful scaffolding; therefore Lei would ensure students are capable of relating learnt skills to new information. Piano students in her class are encouraged to sing the melody and paly with rhythmic games as Lei believes that solid fundamental skills will ensure the positive future development.